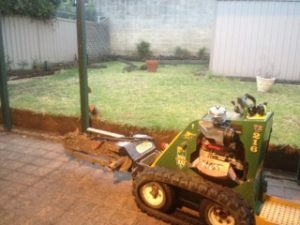 If you want to conduct some backyard earthmoving, the new reality is that access is simply…narrow. By narrow I’m not meaning 1 metre or 2 metres. That space is a luxury! The magic number for really tight access is less than 900mm. Put simply that is around the width of your front door. 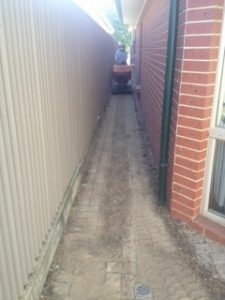 How to handle narrow access if you are doing some backyard earthmoving. Like a good coffee table puzzle that seems impossible, backyard earthmoving with a narrow access can offer the same mind challenge. Seriously, an artist may need to be creative but the mind can get a work out when site access is limited. Like always, most things are possible…if you can throw some money at them. But in the perpetual matrix of solving backyard landscaping problems, effort, time and money stand at the front of the pack. With this in mind, narrow access can usually be solved through an arrangement with the next-door neighbor and some fence panel removal! Or by positioning a skip bin over the back fence. But every now and then those options are just, well, not options. A recent job I conducted as an operator with our machines was such a situation. Restricted driveway space for skip bins. To the credit of the owners Jin and Andy, here was their solution. Andy took 2 days off work! The process was simple, but required perseverance. I got our 800mm TK216 Kid into the backyard…slowly! I loosend the soil with a ripper bar and trenching attachment, loaded Andy’s dumper and he set off (.225m3 capacity-3 bucket loads) 5 minutes later he returned after dumping into the 12m3 skip on the road. I frantically loosed soil in this time and was ready to load him on return. We did this approximately 200 times to rid the back yard of 45tonnes of soil! Well done Andy and Jin! 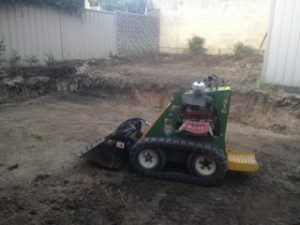 If you have narrow access, take a second look for a backyard earthmoving solution which is possible, for the right amount of effort, time, and money. If you are searching for tight access earthmoving solutions, U Kanga Do It have the tools to suit. Take a look at the range of possibilities here.